November, 14th. At Smart City Expo World Congress, Barcelona. Presentation on the “Chart of Citizen Data Principles”. October, 25th. At “Broadband World Forum”, Berlin. Chair of the City Innovation Track and keynote on “Data Sharing for a Better Urban Planning”. October, 22nd-24th. At “Eurocities Knowledge Society Forum“, Zaragoza (Spain). Event co-organizer and talk on “Open Urban Lab: Collaborative City Making”. May, 29th. At the Master of Architecture in Collective Housing (Polytechnic University of Madrid), Madrid. Masterclass on “Cities as Innovation Platforms: Why, What, How, and… Who?”. May, 8th. At “GovConnect Ontario”, Toronto. Moderator of roundtable “Building and Agile & Nimble Public Sector”. October, 17th. At Eurocities’ Knowledge Society Forum, Uppsala (Sweden). “Strategic Leadership in Cities”. September, 28th. At Digital Media City International Conference, Seoul (South Korea). 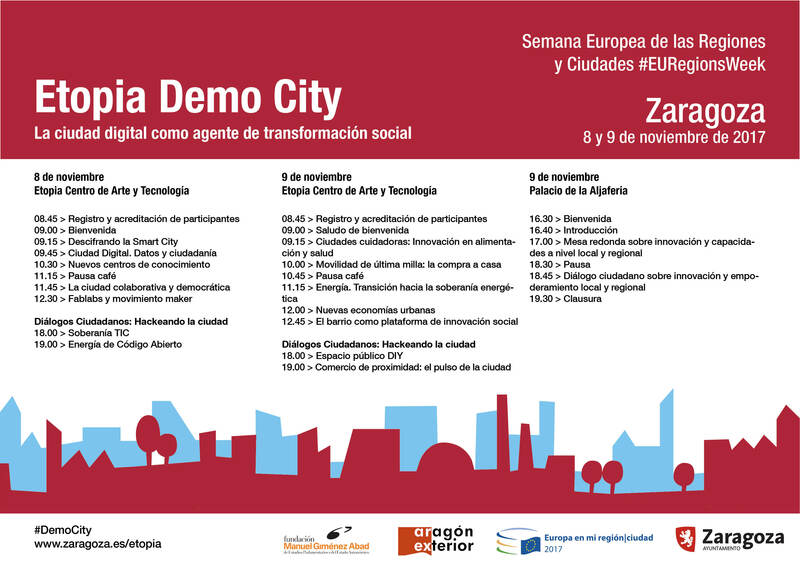 “Zaragoza: from the Digital Mile to the Open Source Smart City”. April, 26th. At Eurocities Green Digital Charter. On-line webinar on “Guidelines for Urban Big Data Sharing”. Listen to the session’s reccording here. March, 8th. At the Master of Architecture in Collective Housing (Polytechnic University of Madrid), Madrid. Masterclass on “Bits, Atoms and Ideas in today’s cities”. February, 6th. At TM Forum Action Week, Cascais (Portugal). “Addressing smart city challenges through data sharing and co-creation”. See review here. January, 25th. At Cities in Transition Conference, Brussels. “The role of data in Zaragoza’s Innovation Policies”. See review here. January, 17th. At Big Data Info Days on Horizon 2020, Luxembourg. Presentation on “Zaragoza Citizen Card: the city’s innovation platform”. See review here. November, 2nd. At Nordic Smart Cities, Stockholm. Talk on “Cities as Innovation Platforms” and panel on “Talent Attraction in Cities”. See review here. October, 20th. At “Etopia Center for Arts and Technology”, Zaragoza. Workshop on “Open, Agile and Lean Startup Principles for Urban Innovation”. See review here. October, 13th. At “Strategic Innovation Summit: Smart Cities Europe”, Dublin. Talk on “Measuring (openly) urban innovation”. October, 6th. At “International Open Data Conference”, Madrid. Talk on “Citykeys: Opening Key Perfomance Indicators for Smart Cities”. September, 20th. At “Etopia Center for Arts and Technology”, Zaragoza. Co-creation workshop on “Bicisur challenge. Promoting intermodality between lightrail and bicycles”. June, 17th. At “Spanish Assembly of the Shared Economy”, Zaragoza. Roundtable on “The Shared Economy as a framework for economic and social transformation”. See review here (in Spanish). June, 16th. At “Advances and Applications of Data Science and Engineering” International Workshop at Real Academia de Ingeniería, Madrid. Conference on “Guidelines for urban big data sharing”. June, 10th. At IE Business School’s “Master in International Management”, Madrid. Lecture in the module “Shaping the impact of disruptive technologies”. June, 1st. At Critical Communications World 2016, Amsterdam. Talk on “Turning critical telecom networks into citizen-centric infrastructures”. See interview here. May, 13th. At Master of City Sciences, Zaragoza. Lecture on “(Making of) an open city”. See post-interview here. April, 19th. At Webit Festival 2016, Sofia. Talk on “The city as an innovation platform”. See review here. Jan, 29th. At Smart energy UK & Europe Summit 2016, London. Talk on “A Guideline for a PublicPrivate Partnership on Urban Big Data Sharing on Energy, Transport and Economics”. See review here. Dec, 4th. At Smartravel Portugal, Bragança. Talk on “The city as an innovation platform”. See review here. Dec, 2nd. At University of Córdoba, Córdoba. Conference on “Extracting value from Big Data in cities”. See review here. Nov, 19th. At EERA Joint Programme Smart Cities´ Symposium (Smart City Expo), Barcelona. Talk on “Measuring urban intelligence through the Citykeys KPI framework”. See review here. Nov, 6th. At Eurocities Annual Conference in Living Cities, Copenhagen. Speed networking session on “Citykeys: Key performance indicators for smart city projects”. See review here. Oct, 28th. At Master of City Sciences’ opening session, Madrid. Lecture on “Cities as our biggest solution providers”. See review here. Oct, 17th. At Politechnic University of Madrid. Roundtable “Ciudad 2020”. See review here (in Spanish). Jun, 5th. At International Conference on City Sciences, Shanghai. Session chair and panelist on “Urban innovation practical cases”. See review here. May, 28th. At Meet and Talk Congress, Zaragoza. Talk on “Smart infrastructures for 2020”. See review here (in Spanish). Feb, 12th. At Agora Urban Planning, San Sebastian. Workshop on “Smart cities without technology”. See review here (in Spanish). Jan, 21st. At Live in a Living City event, Santander. Roundtable on “Humanizing Smart Cities”. See review here (in Spanish). Nov, 6th. At Satellites and Smart Cities – Europe’s Open Days event, Zaragoza. Roundtable on “Business opportunities around satellite and Smart Cities”. See review here (in Spanish). Oct, 8th. At the Inspiring Day – Future of Cities conference, Madrid. Roundtable on “The City Hall in motion “. See review here (in Spanish). Sep, 25th. At the Smart Week Majadahonda, Madrid. Roundtable on “Smart services across Europe”. See review here (in Spanish). Sep, 4th. At the European Network Of Living Labs Summer School, Amsterdam. Roundtable on “Smart services across Europe”. See review here. Jul, 28th. At the Master in Creative Economy (Rey Juan Carlos University), Madrid. Lecture on “A journey through the creative economy”. See review here (in Spanish). May, 29th. At the National Internet Governance Forum, Zaragoza. Panel on “Crowdfunding as a lean start-up tool for public governance”. See review here (in Spanish). Feb, 22th. Roundtable and debate on New participatory processes, Zaragoza. Talk on “Citizen Innovation, the factory of city makers”. See review here (in Spanish). Nov, 8th. Presentation of the book Smart Cities, by Anthony Townsend, Zaragoza. See review here (in Spanish). Oct, 18th. Keynote speech on “Digital public space”, at “Smart City Exhibition”. Bologna (Italy). See interview here. Jul, 2nd. At Etopia Center for Arts and Technology, Zaragoza. Workshop on “Open, agile and lean start-up urban design”, with M.I.T. Professor Michael Joroff. See review here (in Spanish). Jun, 5th. At Paris Citoyen, Paris. Roundtable on “L’europe et le citoyen: une rélation á reconstruire”. See review here (in Spanish). Oct, 20th. At Open Days Europe, Brussels. Panel on “Green, connected and smart mobility”. See review here. Jun, 23rd. At “Broadband Strategies for Cities”, Toronto. Talk on “Connected cities”.